Reblochon is made in the Savoie region of southern France using cows’ milk. It’s rich, fruity and nutty with a semi-soft, almost chewy texture. Or look for a cows’ milk cheese with a washed rind and an earthy aroma. 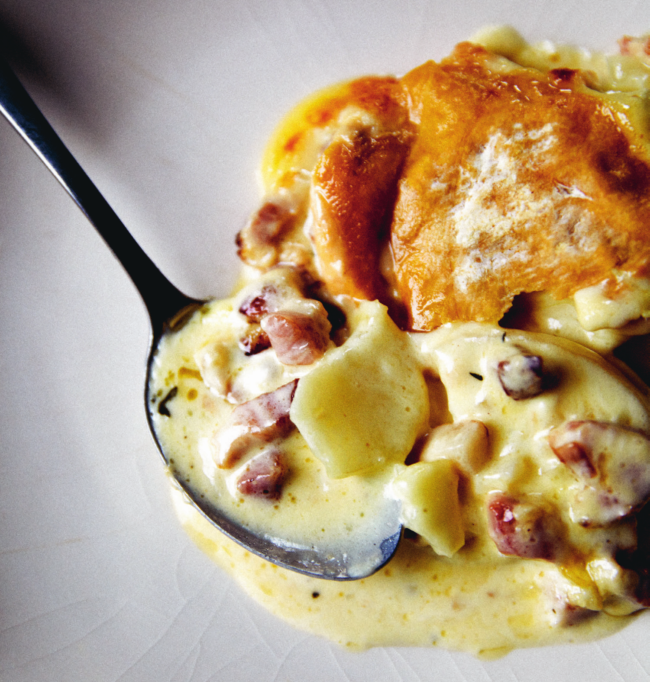 This rich potato gratin (designed to show off the mighty Reblochon) is ever popular with skiers looking for a warming, filling lunch. It makes an ideal winter dish, whether you’re on the French Alps or not. Prepare the lardons (cubed bacon) first by putting enough water to cover them in a large pan over a medium heat. Bring to the boil. Add the lardons and cook for 10 seconds. This removes the excess salt. Drain well. Heat the oil in a pan over a medium heat until hot. Add the drained lardons and fry for 10-12 minutes until crispy. Remove with a slotted spoon to kitchen paper to drain. Next, put the butter in a pan over a medium heat until hot. Add the onion and garlic and cook for 10 minutes until golden, then add the bay leaf and thyme. Cook, stirring, for another couple of minutes, then add the drained lardons and the fl our. Cook for 2 minutes more, then add the wine. Cook for 5 minutes until the wine has evaporated, then add the cream. Reduce the heat and simmer for 5-10 minutes until the sauce starts to thicken. Season to taste with salt, if required, and with pepper and nutmeg. Remove from the heat and discard the bay leaf. Preheat the oven to 190°C (375°F/Gas 5). Peel the potatoes and cut them into 5mm (¼in) slices. Rinse the slices under cold running water, then put them in a pan and cover with the milk and water. Add a few pinches of salt and cook the potato slices over a medium heat for 8 minutes until they are cooked but still slightly firm. Try not to overcook. Drain well. Place the potatoes in overlapping rows in an ovenproof dish and pour the cream and wine sauce on top. Cut the Reblochon in half widthways, then in half again lengthwise to produce 4 pieces. Place the pieces on top with the rind face up. Bake in the oven for 10-15 minutes until golden and bubbling.